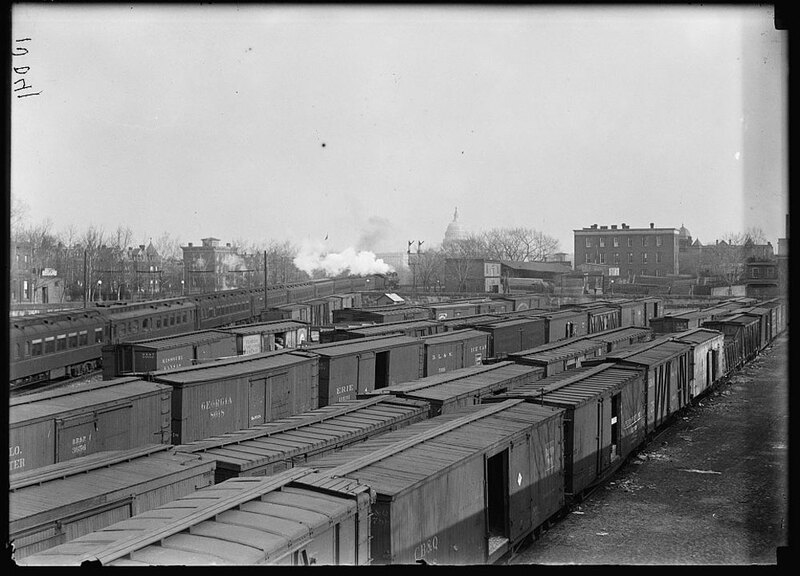 A freight house yard in Washington DC, circa 1917. Note the different box car roof materials. Many cars here are of less than 40 foot length. Image from the Library of Congress American Memory collection. One of the great myths of model railroading is the delegation of 36-foot box cars to the decades before World War One. In 1930, there were just over 1.2 million box, ventilated and automobile cars on North American railroads. 44% of this box car fleet was composed of cars less than 40-foot in length. That totals just over 530,000 cars. Fifteen years later, the numbers are reduced, but remain significant. 876,000 box, ventilated and automobile cars were rostered on North American railroads in 1945, and 14% of those were of less than 40-foot length. These cars totaled just under 125,000. Less than 40-foot length could be 35, 36, or 37 feet long, and there were some batches of 38 foot cars as well. Here are a few of the major owners of short box, ventilated and automobile cars in 1930. As a comparison, here are the top owners of short box, ventilated and automobile cars in 1945. As another comparison, the number of assigned USRA single-sheathed and double-sheathed box cars totaled 50,000. One of the only easily found, HO scale, injection-molded, plastic options for 36-foot box or refrigerator car models is a double sheathed, truss rod car offered by Model Die Casting (MDC) in their Roundhouse line for many years. These models are now available from Horizon/Athearn in their Roundhouse line. Sadly, just subbing in a bunch of these cars won’t really convey the texture of a pre-WW2 freight car fleet. Many short box cars were updated in the teens and 1920s with metal ends, improved roofs and steel underframes. Thousands more were built new with steel ends, roofs and underframes in the years preceding WW1. The Roundhouse models lack these modern components. Since Dave models 1928, he needs quite a few of these “modern”, 36-foot box cars. After some conversations and research, he found these details on the NKP 10000 series cars. 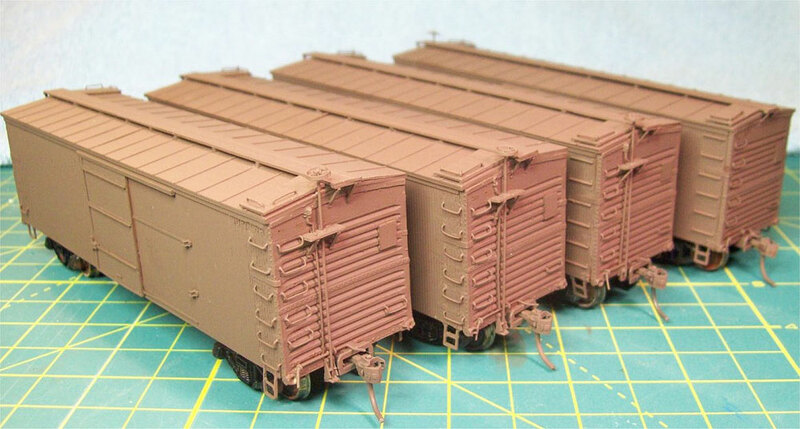 Here’s a prototype image of the box cars that Dave is modeling. Thanks to Ray Breyer for sharing this image from his collection. Over the last few years, Dave had acquired several of the Roundhouse 36-foot box car models, so he compared the prototype image and the model and made notes on modifications to transform the model into a close resemblance of a NKP 10000 series box car. The four main portions to upgrade are the roof, doors, steel ends, and the underframe. Dave created masters for the underframe and ends in order to easily cast parts to use on multiple cars. The same ends and underframes can also be used on a few other NKP box cars that are slightly different than the 10000 series. One of the issues is just how obsessive I want to be about the level of detailing. I continue to feel a sense of urgency to get a bunch of cars running, which leads to the inevitable conclusion that I just have to be reasonable. It can be easy to go off the deep end in building and detailing one model, but when you need a good size fleet choices must be made in the level of detailing so freight cars and locomotives can enter service. Here’s an image from early in the build. Dave: There’s a lot to do… fiddling with grabs, more end detail, roof detail, brake detail, etc… But at least you can see enough from the picture to get an idea of what I’m trying to do. The basic pieces come from the old MDC 36′ reefer kit. 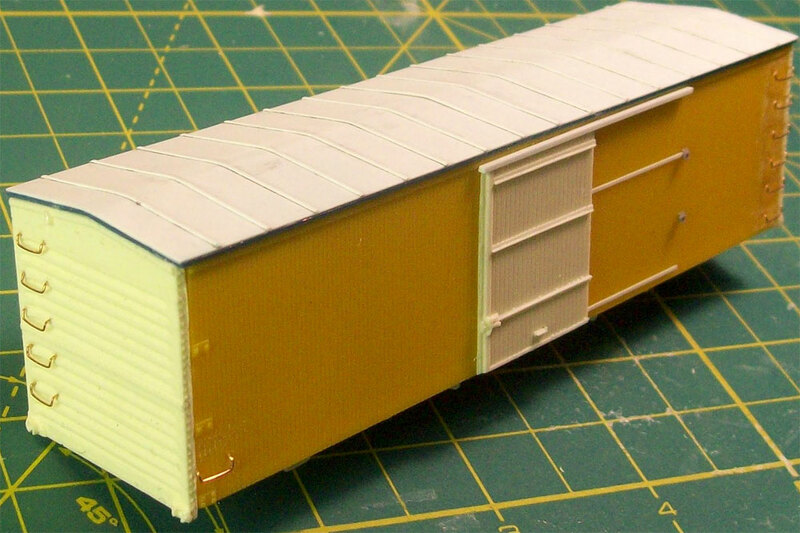 I overlaid the roof with 0.010″ styrene and cast my own underframe, ends, and doors. Dave: Cranking out these 10000’s four at a time is a good idea, I suppose, but I find myself sorely tempted to just go ahead and just finish ONE!!!! Just for the sense of accomplishment! I’m down to the last fussy details… brake platforms, tack boards, roof walks, and finally brake gear including cut levers. Each of those steps takes a LOT of time (at least for me) and I find myself running out of patience. That means I take a lot of breaks, get distracted by other things, and the whole process slows down. I SHOULD have finished all four of these things yesterday, then painted them this morning. Instead I’m STILL fooling with the fussy details! At this point you may be wondering why Dave has bothered to do this much work, and I think that passed though his mind as well. In early discussions, he felt it was important to build models that had a strong resemblance to several of the NKP freight cars of the 1928 era. These cars were part of the NKP fleet and needed to be represented on his railroad layout. Dave set goals long ago for his model railroad and building the fleet he envisioned is part of the process. In addition to detailing the models, Dave created his own dry transfers that follow the lettering styles of the 1928 era. While the build took a few months, he has several great looking models and Dave has learned skills that will assist with the next batch of box cars and many future projects. Dave: Four MDC car bodies down…. thirty-one to go!!! Here are two of Dave cars painted and lettered. The all brown car is in original 1916 paint and lettering. The car with the black roof and ends reflects a car that has been repainted in the mid-1920s. The large Nickel Plate Road lettering came along with a batch of different cars during World War One. This larger lettering was added as older freight cars were renewed and repainted, and was a feature on cars that were acquired in the 1920s and 1930s. I hoped you enjoyed Dave’s work. I look forward to share more of his adventures in the future. Your comments are encouraged. All comments are reviewed and approved before they appear here. I see that two out of the four cars have the MDC cast-on grabs left in place, instead of replacing all the grabs with wire ones. This makes sense, I guess, for a fleet-builder exercise. I do like it that he has two that DO have the grabs, just to show how far this kitbash can go. I really need a few of these for my layout, as well! I don’t have as many shorties as I really need, and they add a nice texture to the otherwise steady stream of 40′ cars. In some ways I agree with you Dean, but I have not gotten around to actually scratchbuilding a similar box car. I thought Dave has done a fabulous job transforming a basic HO scale kit into a much-needed box car that can be used on model railroads from 1916 to 1950. Some nice work, here. I like the idea of casting some of the parts for, as Dave indicates, these will go a long way in creating additional cars of similar design. I wonder what he used for the masters for the end casting? The MDC reefer is a very useful kit for this type of project. I have used it to build a number of meat reefers that fit my era of 1950-52 and I suspect it will also work for a number of other boxcars, too. It is a still pretty good body casting, considering how long this kit has been in the market. Dean: the main reasons for using something like the Roundhouse 36-footer for a kitbash, instead of a full scratch job, are time, cost and durability. They’re all interrelated. The Roundhouse cars can be found for VERY little money, especially if you luck out and can find them in bulk, or as an older kit that someone just wants to get rid of. Evergreen isn’t cheap any more, and a couple of sheets of their car siding plus the strip material needed for bracing and the underframe can cost as much as one of the kits. With the kit you also get a nice, sturdy box structure (body, floor and roof, if nothing else) that you KNOW is layout ready. With more than half of your work already done it’s a quicker option than a full scratch job, and you can focus on hanging details that make each car unique to its intended prototype. True, there IS a sense of satisfaction that comes with 100% scratchbuilding a car (and that part of the hobby is one big reason why I’m backdating), but for a large-ish fleet like Dave needs, using “something to create something else” does save him a LOT of time, effort, and frustration. Casting major components like doors and ends really speeds up the process as well. Being pragmatic about things like cast on grabs and fudging a dimension here and there also speeds up the process. And unless you’re someone who’s modeling primarily to enter things into contests, getting the overall look of a model right is far more important that slavishly following every inch on an elevation drawing. How did you make the ends? Are they reverse 7-8 or what? Wayne, these are 7/7 inverted Murphy steel ends. Dave made a mold from a part on hand then cast the parts needed for this project and some upcoming box cars in anohter series.